European Regulation - Mr. Creosote regrets……..
Home > News & Views > Mr. Creosote regrets……..
We hear that ESMA (The European Securities and Markets Authority) the euro regulator, is looking to increase their “Mr. Creosote” dietary intake of cash. ESMA, along with many other Euro regulatory bodies, was set up in January 2011. They reason that the cash is needed because “mission creep” is taking it from legislation drafting to regulating the regulators. Have things got so bad with powerless or spineless governments, that regulators now need regulating or is the mission creep part of a euro wide regulatory “job breeding programme’ designed for the boys by the boys? ESMA’s diet is fed by way of ingesting money from regulators in member states as well as the EU itself and it is understood that the FCA and PRA will be sending ‘food aid’ in the form of nearly £1.8m in ‘readies’. 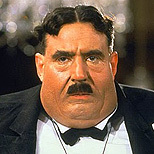 Steven Maijoor, a career euro regulator who heads up ESMA, reckons that their funding model, rather like Mr. Creosote’s diet, is becoming a problem and that the cost of feeding the voracious appetite has the potential to stunt it’s growth. He said in 2012 “We have 85 staff now and expect to have 100 members of staff by the end of this year and then a further 60 members of staff by the end of 2013. Resourcing is not easy under the current austerity measures in Europe, as we are partly funded by the national regulatory authorities of the member states, many of whom are under budgetary pressures themselves. However, we think that the projected staffing levels are reasonable given the work Esma has to do. He went on to say, “It is still our strong wish to be funded through the EU budget rather than through the national authorities directly. The way we are funded is not consistent with the way other European institutions are funded and so we should move to 100% EU funding, especially as Esma grows and the bill gets larger for national authorities”. Is this is yet another example of Europe creating regulation for regulation’s sake. The logical approach, something not ever found in the world of regulation, would be that regulation is either all done through Europe as a common policy or through member states with ultimate control of regulation by their democratically elected governments. UK financial services firms have seen significant increases in regulatory costs in recent years. The FCA and the PRA have a combined total budget for 2013/14 of £646.3m, a 15 per cent increase on the defunct FSA budget of £559.8m set for 2012/13. Advisers are seeing increases of over 15% in regulatory fees from £32.8m in 2012/13 to £37.9m in 2013/14. How long till the “Waffer thin” mint is eaten?